A proper balance between oxidants and antioxidants is necessary in maintaining health and longevity. Alterations in this balance may result in oxidative stress causing functional disorders and diseases. Oxidative stress is considered to play a vital role in the pathogenesis of diabetes and its complications. Flavanones and flavanones-rich botanical extracts have been a subject of great interest for scientific research. Citrus flavanones like naringin and hesperidin exert a variety of biological activities such as anti-oxidant, anti-inflammatory, antihyperglycemic, anti-apoptotic etc. Naringin and hesperidin along with their respective aglycones, naringenin and hesperetin have been shown to attenuate diabetes and its related complications. 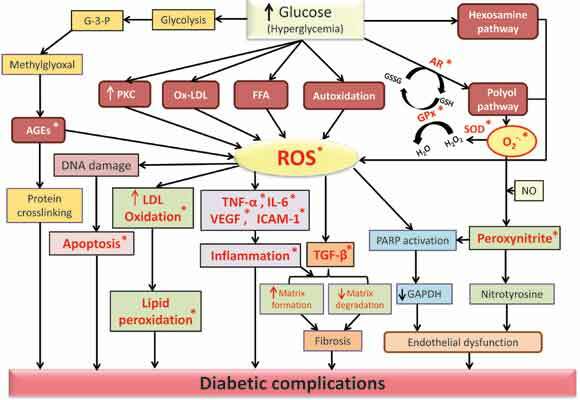 This review discusses the role of flavanones as a possible emerging treatment for diabetes and its complications along with the possible mechanistic explanations. Diabetes, Diabetic neuropathy, Diabetic cardiomyopathy, Diabetic retinopathy, Citrus flavanones, Oxidative stress, Anti-oxidant. Molecular Neuropharmacology Laboratory, Department of Pharmacology and Toxicology, National Institute of Pharmaceutical Education and Research (NIPER), S.A.S. Nagar, Mohali, Punjab, India.